Always on the lookout for anything new about Feynman, I was delighted to read a short piece in the Nature, Sept. 13, 2012 “Books & Art” section called “Modelling Feynman.” It featured “All Possible Photons: The Conceptual and Cognitive Art of Feynman Diagrams,” a Manhattan gallery opening by Edward Tufte. Tufte is a statistician and possibly the world’s most celebrated information designer. His pursuit was to let loose his fondness of artistic explanation with sculptures recognizable to those with knowledge of particle physics. 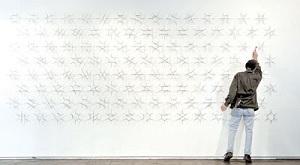 Included in the exhibit is Tufte’s most powerful piece, a collection of 120 smaller pieces that give the exhibit its name – a cluster representing all possible space and time paths of a particular interaction of photons (see inset image of Tufte at work). One of Feynman’s most memorable accomplishments was his elegant patterns of lines, dots and arrows to describe and predict how subatomic particles interact. Feynman had a sense of the diagram’s aesthetic appeal and in fact drove a large van adorned with hand-drawn diagrams. If you find yourself in the vicinity of the Big Apple, seek out: ET Modern until spring 2013 (official opening September 15, 2012). Tufte’s mural-like piece reminds me of something similar I encountered earlier this year when I visited Feynman’s old home after a long absence due to extensive construction. 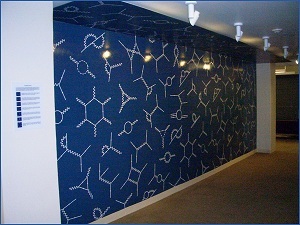 Just outside his old office, 456 Lauritzen Hall at Caltech, is a wall mural of beautiful Feynman diagrams (see inset image). Very motivating indeed!